Forming a solid base to 2003 US Mint proof set value is a combination of factors. A series of "firsts" in designs, the State Quarters in general and silver alloy in proof coins of one of the set options. 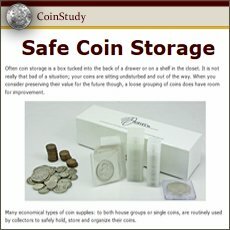 Proof coins are struck using are a special minting process. 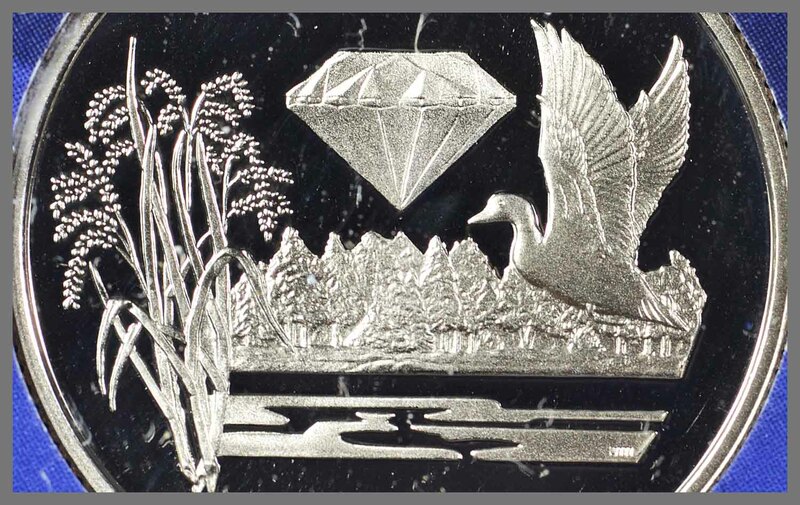 Highly refined dies are used, each polished and prepared to impart a frosted finish to the raised areas of the design and mirror surfaces to the fields of the coin. Minting of proof coins also involves additional care throughout the process with careful handling to assure no imperfections disturb the delicate proof quality. Accurately identify your set from the three different options offered in 2003 by the US Mint. Option one of the 2003 proof set offerings from the mint is the 10-coin set. Features all circulating coins at the time in the proof finish. Each coin is the same clad alloy as the circulating coins. Displayed and packaged in two plastic cases. The cent through dollar is housed in one case. An overall two-tone blue flag with white stars is the image on the insert spacing the coins. The reverse of the case incorporates the US Mint Seal in white on a solid blue colored insert within the case. Displayed in the second plastic case are the five new State Quarters for 2003. The reverse of the quarters is displayed with a two-tone flag graphic insert positioning the coins. Flipping the case over the reverse is the portrait side of the quarters surrounding the 50 State Quarters logo in white printed on a blue insert. 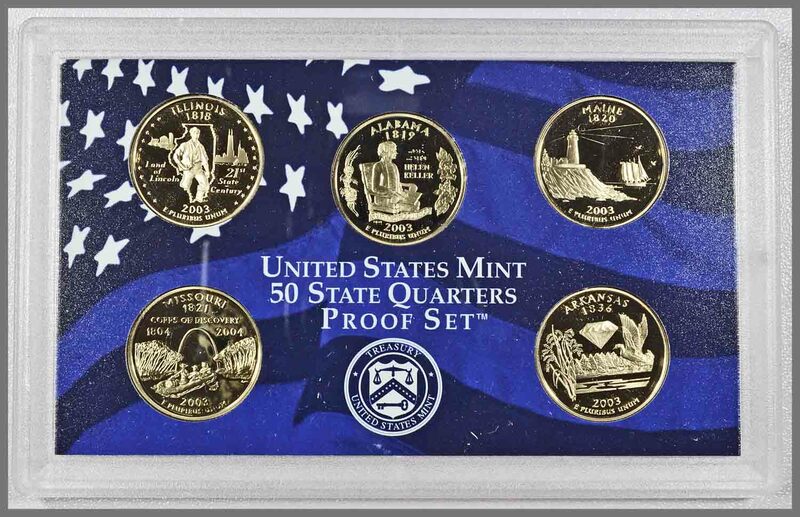 An option presented by the mint in 2003 is the proof set featuring the five State Quarters sold as a separate set. One plastic case displaying the Illinois - Alabama - Maine - Missouri - and Arkansas State Quarters struck in the clad alloy. An insert with an American flag image in two tones of blue representing the red and white stripes of the flag is holding the quarters. The reverse is the mint logo of the State Quarters printed in white on a blue background. An American Bald Eagle is the image to the box housing the State Quarters proof set. The eagle in tones of blue, 50 State Quarters Logo, and the date 2003 printed in silver. State name of the quarters within the set are across the bottom of the design. The reverse design of the box is a map of the US with the states of the 2003 quarters highlighted. Leading in 2003 US proof set value is the silver set. Two plastic cases house 10 coins with designs identical to the circulating coins of 2003. The first case displays the cent through dollar, however the dime and half are 90% silver in composition. Second case of the set are the five State Quarters all are 90% silver alloy. Both cases contain a similar insert displaying the coins: a US flag graphic in two tones of red with white stars. "Silver Proof Set" as part of the text identifies the special silver alloy of the coins within the set. Continuing the red theme of silver proof sets. One outer box holds the two plastic cases. An image of the Statue of Liberty profile in light red along with the State Quarters Logo, silver is also indicated clearly on the box. All fifty states are designated by the fifty stars beginning at the top and finishing along the bottom border to the box. Special qualities of the 90% silver coins in the set, the Roosevelt dime, Kennedy half and the five State Quarters serves as a strong base to value of the set. Minimum silver value is $20.06 for these seven coins, current as of 4/22/2019 with silver in the $14.99 range. A young Abraham Lincoln striding through an outline of the state is central to the design of the Illinois State Quarter. Born in 1809 Lincoln grows to become president during the years of the Civil War. A symbol of Illinois's agricultural power is represented by the farm house, barn and silo left of Lincoln. Chicago, the largest city of Illinois is seen in a skyline view completing the major designs to the quarter. The official state slogan, "Land of Lincoln" honors Lincoln. US Circulating Coinage First: Abraham Lincoln is featured as a young man. Lincoln is well known on the US cent first minted in 1909. His portrait on the cent is of Lincoln's later years. Hellen Keller a renowned citizen of Alabama is honored on the Alabama State Quarter. Hellen who was deft-blind is depicted reading braille. Braille is also above her name on the quarter making it unique in circulating US coinage. Framing the sides is the state tree; Alabama long leaf pine and magnolias to the right. A circa 1920 photo indicates Hellen's fondness of the magnolias. US Circulating Coinage First: Braille is used on the Alabama State Quarter in Hellen Keller's name, a first. Also, a first in depicting a disabled woman on US circulating coins. Pemaquid Point Light a historic lighthouse is featured on the Maine State Quarter. Maine located at the northeastern most part of the US, shipping was important to its commerce. Well maintained lighthouses were essential. Built on exposed bedrock, the scene of the lighthouse includes the keeper's house and additional buildings. At sea is a well detailed 3-masted schooner. The lighthouse scene was decided by vote of Maine residents to become the design featured on the State Quarter. The dramatic setting of the lighthouse above the water is well detailed, fencing is recognizable as well as the northern pine. Sea gulls above the schooner are well rendered. US Circulating Coinage First: A lighthouse featured on a circulating coin design is a first with the Maine State Quarter. Missouri advancing into the present is depicted by the Jefferson Nation Expansion Memorial Gateway Arch. A strong reference to the achievements of the expedition and President Thomas Jefferson who commissioned the journey. Arkansas's official nickname "The Natural State" influences the design of the Arkansas State Quarter. Setting the background is a forest scene depicting its importance to the economy. A mallard duck in flight over water points to its wildlife. With diverse terrane Arkansas natural resources extend across the entire state. A well detailed diamond is in reference to Crater of Diamonds State Park. The high level of detail rendered on the proof Arkansas State Quarter is very dynamic in the design. Rice is ready to harvest in the foreground; each leaf is finely detailed as well as the multitude of rice grains. A mallard duck flying over water is high in profile and minutely detailed showing individual feathers to the wings. In the background is a forest representing the diverse timber regions of Arkansas. Recognizable within the scene are pine and deciduous trees. Developing a theme to your proof sets is an advanced collecting approach. 2003 proof sets contain some of the early issued State Quarters. A complete collection in the proof finish would include 50 coins, all with unique designs. The State Quarters are widely circulated and recognizable. Familiar with everyone, a set containing pristine proof condition coins is an impressive set. Two main choices to the theme of a proof quarter set are available. The clad issues representing the proof version of the circulating coinage. These proof clad issues were a separate offering by the mint at the time, complete with their individual packaging. Five different designs each year spanning 1999 through 2008 a total of fifty quarters. A second choice is the 90% silver proof version of State Quarter. Early in the State Quarter program the silver State Quarters were part of a larger set including the rest of the denominations. The five quarters however were all within one plastic case. Later years featured the silver proof quarters as a separate option with a distinctive separate packaging. Either the circulating alloy or the silver alloy proof quarters are a worthy and interesting collecting theme. Popularity of these sets is high and a strong support of 2003 US proof set value. The US mint in its press releases at the time of the 2003 proof set often cited the popularity of the coins. Highlighting these statements was their estimate of 130 million people interested in the State Quarters. This popularity increased demand for the proof versions of the US coinage to over one million sets in 2003. One item of note: Proof sets are a popular way of collecting coins. Sets are priced individually and are considered "complete" to include the original plastic cases containing the coins, the outer boxes the sets are housed and the Certificate of Authenticity (COA) included. Preserve your 2003 US Mint proof set value by keeping the entire set intact. Proof coins sold as sets began in 1955, release of the proof coins within sets continues to the present. Values are found for each date and option on the chart. All US coin values. Identify your coins by matching to the image links leading to value charts. Additional points to value are considered Date | Mintmark | Condition - each described and imaged within each series. Surprising value is often found in the smallest of detail.